Cheyenne Johnson on CR Tuff Boo Bear. Seth Petit Photography. 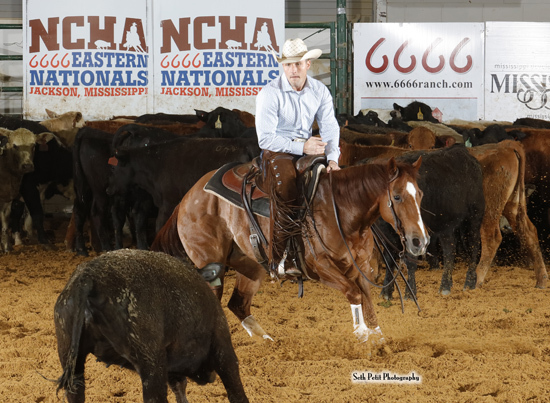 Cheyenne Johnson, Pine Level, Ala., scored 219 points on Friday, to win the NCHA Eastern Nationals $50,000 Amateur championship for the second consecutive year. Doug Secrest, Blacklick, Ohio, was reserve champion with 216.5 points, and Jason Britt, Seven Springs, N.C., posted 214 points to place third. Cheyenne Johnson won last year’s $50,000 Amateur Eastern Nationals on Tom E Toy, by Thomas E Hughes. This year she was aboard CR Tuff Boo Bear LTE $51,410, by Woody Be Tuff, who also scored 219 points in the first go-round of the Amateur. Johnson is the NCHA earner of $65,596 and was winner in 2012 of both the Todd Drummond Memorial and the Greg and Whitney Welch Memorial Awards. She also won the NCHA Eastern Nationals Junior Youth championship in 2009, and followed with the NCHA Eastern Nationals Senior Youth championship the next year, as well. Both times she was riding Freckles Blue Jewel LTE $39,466, by Duals Blue Boon, who carried her as an Eastern Nationals Youth finalist for six consecutive years. Doug Secrest on Smooth Spyder Rey. Seth Petit Photography. Doug Secrest had shown his $50,000 Amateur reserve champion, Smooth Spyder Rey LTE $69,854, as a finalist in the $25,000 Novice/Non-Pro finals on Wednesday, March 13, at the same time that he also showed Dual Smart Sherman LTE $25,500. Both horses have carried Secrest as an amateur and non-pro limited age event finalist as well, most recently at the 2019 Augusta Futurity, where Secrest and 6-year-old Smooth Spyder Rey, by Smooth As A Cat, placed sixth in the Non-Pro Classic. Secrest also was a finalist with 9-year-old Dual Smart Sherman, by Dual Smart Rey on Friday, in the $50,000 Amateur finals. Jason Britt, the NCHA earner of $97,549, showed DMAC Hipster LTE $52,624, the horse he also rode to claim last year’s Eastern Nationals $50,000 Amateur reserve championship. Britt and the 6-year-old Hickorys Indian Pep gelding have been finalists in numerous limited age events, including earlier this year, where they placed third in the Ike Hamilton Amateur Classic and fifth in the Augusta Futurity Classic Amateur Unlimited.